Kubu Reef is located near Kubu village a few kilometres west of Tulamben. A sealed road leads from the centre of the village down to the shore. At its end is a basic dive preparation area and directly offshore are two dive sites, both accessible from the shore. Looking straight offshore, one is off to the left, the other slightly to the right. Both sites require a 50 metres swim out to deeper water, though the swim is over picturesque shallow reefs. The 'left' reef has a large area of delicate branching corals starting at the edge of the deeper water. Beyond depths of 15 metres are large barrel sponges and one huge gorgonia fan. The 'right' reef has large coral covered rocks and bommies in the shallows and deeper is a ridge with very rich soft coral growth. 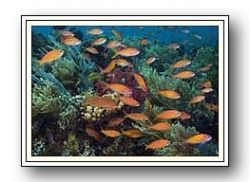 Both areas have fantastic fish and invertebrate life, with regular shark, barracuda and larger fish sightings.